Before traveling, do you buy guide books, research on TripAdvisor and look at websites with tips for traveling with kids? The kids love going on holiday with you! They will enjoy it more if they are involved in the planning process. Watching videos about the place you are going is a great also reading a book together. We try and include the kids as much as possible when we going somewhere new. A couple of times Big Kiddo has picked the hotel for all of us. Here is a great little book we read before coming to Bali, we still read it often and will cherish it for years to come as a memory of our time here. Dad loves guidebooks, history novels, and anything travel related. He collects books like kids collect seashells. I personally like adventure novels like Michael Chrichton. We have different tastes but love reading just the same. Big Kiddo loves big picture books, his latest favorite is a book of Indonesian Volcanoes. Small Kiddo loves stories about animals. Before moving to Bali, dad came to the Island of the Gods to check it ot. When he got back to Phuket he brought along this cute little book for the kids. We were all instantly drawn to it and the stories written and illustrated through the eyes of a group of local and foreign children. The outside of the book is checkered black and white which is pretty eye catching. Its a celebration of Saput Poleng, the most special Balinese fabric design. Our kids call this “tela bali” and its used to cover sacred trees, statues, and as a sarong by members of the villages during a ceremony. WHY IS THE BOOK SO AWESOME? What I really like about My Life in Bali is how its set up. A bit like a guide book, a bit like a story book, and most completely like a cultural and artistic fountain of knowledge. The writing is on the left and the wonderful illustrations are on the right. What I loved about the illustrations is that the children were not only Balinese but also European looking. There is no need to read from start to finish, it´s great to pick up at any time and read a few pages. The kids love it as a bedtime story. 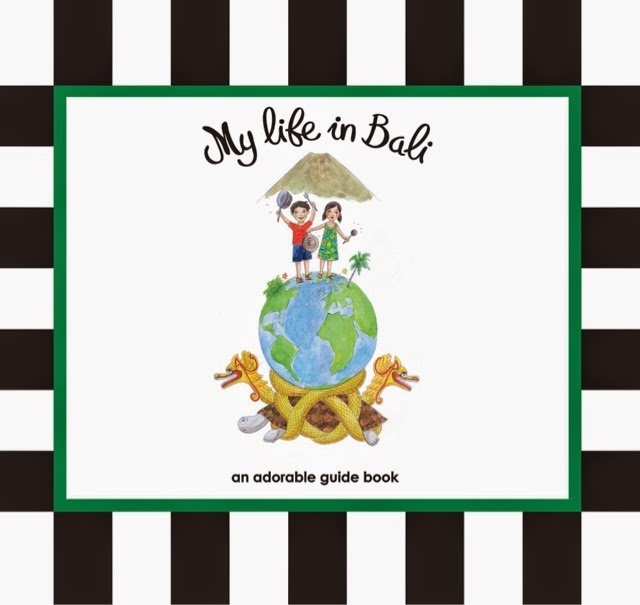 The book goes into detail about every single aspect of Balinese culture; family, way of life, traditional ceremonies, food, names, and special dates in Balinese life. The topics flow from one to the other seamlessly if you wish to read it from beginning to end. Every page is a new wonder to behold. The Author is Sandrine Soimaud, a French woman who had a stint in Bali and fell in love with it. The writing of the book was a way for her to connect fully with the culture and experience it all first hand. You can read more about her, the wonderful Balinese people who helped her and the illustrators that made the visual magic come to life, here at the Bali Advertiser. If you are coming to Bali or just love Bali, and even if you don’t have kids, this book is great to have and there’s a section in the back for taking notes. The information is so extensive you feel like you know all of Bali once you are done reading it. It really just makes you want to come to Bali instantly! The book is available in all major bookstores in Bali and can be found online through Garuda and Periplus bookstores. This is not a paid advertisement, we just really love the book! You will too.